Chicago high school students, with some guidance from WTTW, recently produced stories showcasing one family’s journey from Bangladesh to Chicago and an open mic event sponsored by Grammy-winning artist Chance the Rapper. 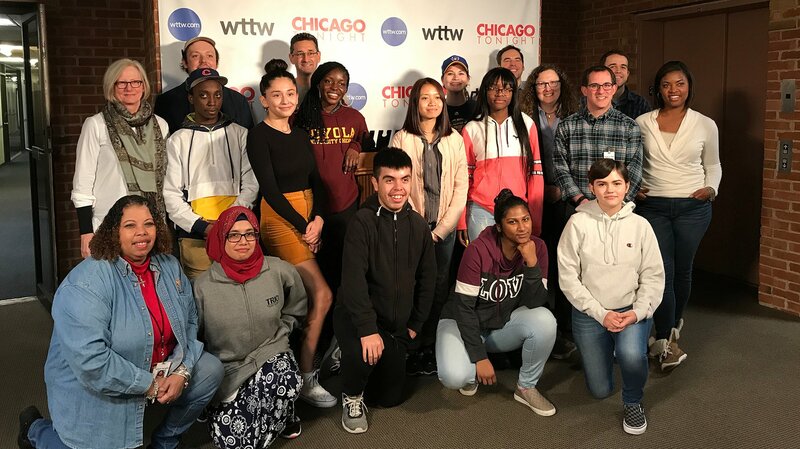 Chicago Public Schools students from Senn High School visited WTTW last year to pitch their story ideas and tour the television station’s operations. “They cover school news, filming most events at the school, getting interviews, providing previews of what will happen the following week,” said teacher Michael Cullinane. After discussions between the students and members of the “Chicago Tonight” team, the class split into two groups with the goal of producing two stories: a profile of Sultana’s Bangladeshi family in Chicago and a video covering OpenMike, a monthly showcase for CPS students to display their talent sponsored by Chance the Rapper’s SocialWorks nonprofit. Students learned how covering each story required a different set of skills. For the open mic event, students had just a few hours to obtain the footage and interviews they needed to cover a single-night event. But Marquez said the learning experience helped prepare him for the future. “Now, if I was to do it again, I wouldn’t hesitate to ask anyone for an interview,” he said. Circumstances were different for the profile about the Sultanas – a mother and five daughters who emigrated from Bangladesh to the U.S. in 2011 to find a better life. Tajkeya Sultana had plenty of access and time to film and interview her mother and sisters. Her group ended up with roughly six hours of footage to edit into a short, compelling video story. Student Olabisi Efunnuga said the editing process helped her learn how to better collaborate with fellow storytellers in order to achieve a shared vision. Through both stories, students were exposed to a spectrum of storytelling methods and production styles. Throughout the process of creating these stories, Cullinane and his students communicated with WTTW Community Engagement Director Jessica Lawson and yours truly – I’m a “Chicago Tonight” producer. We visited Senn High School in December to give feedback on the students’ stories. Cullinane said the students will continue producing weekly “SennTV” shows until graduation in the first week of June.